Most people move on the last or first day of the month. Often they’ll wait until that first weekend of the new month to make the move. That means the movers you book could be double booked. They might rush your job to get to another job. If you can move during the week, then you might be able to catch a break. It’s also helpful when banks and utilities are open in case there’s any trouble to deal with at your new place. You should probably arrange to have the utilities turned on in your new apartment at least two weeks before you make the move. Additionally, you should leave the utilities on at your old place for a few days to give you time to clean up with the power. Be sure to check out the new space for phone outlets. If you require rerouting, then you definitely want to schedule with the phone company as soon as possible because their appointments become busy at the first of also. The moment you give notice means you have 30 days to vacate the premises. That is more than enough time to pack up everything you own. A good plan would be to pack a few boxes every day. If you can knock out a shelf for a kitchen cabinet in a day, then by the end of the week you will have a lot done. It might mean living surrounded by boxes but it’s much less stressful than packing on moving day. Don’t just put the room designation on a box but also its contents. This is especially important when you’re packing up things like remote controls or television cables. There’s also kitchenware that you might need to unpack first before you get to all your gadgets. It’s very exciting for you and your pets to move into a new space but that doesn’t mean they have to be there on that first day. It might be a lot smarter to send your pet for daycare for grooming on moving day. As you pack up all your stuff, you’re going to discover a lot of things you could do without. These are all the outfits you don’t wear anymore, the computers that you’ve already replaced and the extra household goods you simply don’t need. 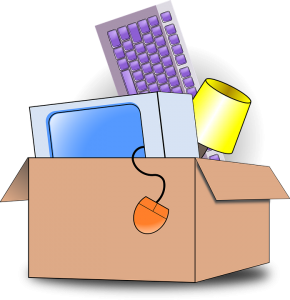 None of the stuff should be brought with you to your new home. Instead, turn it over the Junk King Cincinnati. When you set up a junk removal session was Junk King Cincinnati be put in charge of two strong movers who have their own truck. They’ll do all the lifting and loading but this time your stuff will be going away for good. You can always count on Junk King Cincinnati to get rid of your old clutter before moving into a new home. This entry was posted in Junk King Cincinnati and tagged clutter, Junk King Cincinnati, next move on June 30, 2017 by Junk King. Last updated June 30, 2017 .